Eric Marinus, John Stephens , Heather Bunch, Nora Montanez, China Brickey in THE PRIVATEER. In the newest work by Transatlantic Love Affair, a wealthy merchant dreams of adventure and takes to the seas, getting in way over his head. Jay Gabler says, "The Privateer is a more broadly comedic play than the typical Transatlantic Love Affair offering, and it's rich in character-driven humor." TALKIN' BROADWAY: The incredibly inventive theater company Transatlantic Love Affair creates whole worlds from nothing more than the bodies and voices of its acting troupe. Arty Dorman says, "The Privateer is a comedy, an adventure yarn, and a cautionary tale about the pitfalls of false leadership....Those who are unfamiliar with the company are advised to try setting sail with The Privateer." 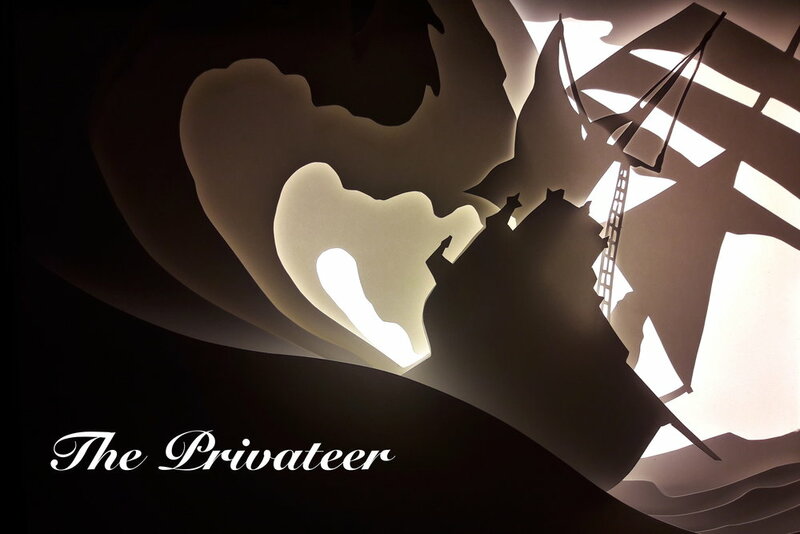 PIONEER PRESS: 'Privateer sets sail in fine form..."
Dominic Papatola says, "It's a performance style and a company that has demonstrated its ability over the years to make seemingly small stories feel epic and ephemeral." Jill Schafer says, "TLA fans are sure to love this new, exciting, dangerous tale. And if you haven't seen TLA before, what are you waiting for?!"